RENSSELAER, N.Y. — NYISO experienced six days with peak loads of more than 31,000 MW this summer, compared with last summer’s actual peak of 29,677 MW, the ISO’s Management Committee learned last week. New York ambient temperatures were above the 20-year average in May, July and August, and near average in June. Albany registered 19 days over 90 degrees Fahrenheit this summer, which has occurred only 10 times since 1874, Wes Yeomans, vice president of operations, said as he delivered the Summer 2018 Hot Weather Operations report. Total New York Control Area load was above 50/50 projections this summer, while peak load was below the 50/50 projection for the fifth consecutive summer. The summer 2018 50/50 forecast was 32,904 MW, while actual peak load hit 31,861 MW on Aug. 29. The all-time peak of 33,956 MW occurred on July 19, 2013. NYISO on Aug. 29 activated 481 MW of demand response for Zone J to support New York City transmission security from noon to 6 p.m., while utilities in the state also activated their DR programs. The ISO will report scarcity pricing outcomes at the Market Issues Working Group meeting in October. Pallas LeeVanSchaick of Potomac Economics, the ISO’s Market Monitoring Unit, said the ISO called DR in Zone J for the two largest contingencies, not just the single largest. Yeomans replied that the ISO is engaged in a project to review reliability criteria. Significant summer transmission outages were the 345-kV Hudson-Farragut B and C Lines, the 230-kV St Lawrence-Moses L33P and the 345-kV Dunwoodie-Mott Haven 71, which was forced out on July 1 in New York City near the beginning of a six-day heatwave and remains out of service. Many more outages occurred, but the ISO only reports those that were out for a long time and impacted power availability during a heatwave, Yeomans said. Yeomans said pop-up showers on a hot day can reduce load by around 500 MW, prompting Mark Younger of Hudson Energy Economics to suggest that the weather normalization program at the ISO should try to account for this effect on net load. Weather normalization refers to smoothing chaotic weather data from several years in order to provide a useful model for load forecasting. NYISO CEO Brad Jones informed the MC about why the ISO’s Board of Directors had not yet voted on the AC Public Policy Transmission Project approved by the committee in June. The MC in June approved joint proposals by North America Transmission and the New York Power Authority to build two 345-kV transmission projects that could cost $900 million to $1.1 billion. 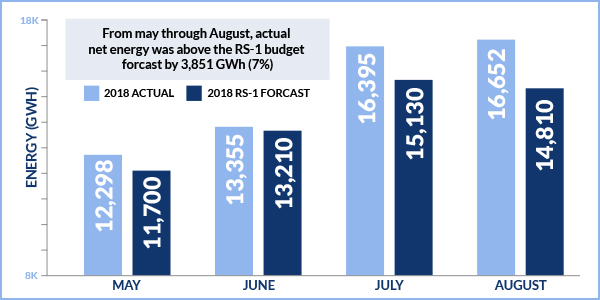 The ISO’s draft 2019 budget totals $168.2 million, including an 8.03% increase in revenue requirement from this year’s budget and a 0.45% decrease in projected megawatt-hours, for an overall Rate Schedule 1 increase of 8.51%. Alan Ackerman of Customized Energy Solutions, chair of the Budget and Priorities Working Group, presented the review of a budget allocated across a forecast of 157.1 million MWh, for a Rate Schedule 1 charge/MWh of $1.071, compared to $155.7 million allocated across 157.81 million MWh for a Rate Schedule 1 charge/MWh of 98.7 cents this year. The ISO has held the budget to an approximately 1% average increase in revenue requirement for the past four years, “but this trend is not sustainable for the 2019 budget,” Ackerman said. One big factor driving up spending is repayment of a $30 million loan to finance an Energy Management System/Business Management System upgrade project, Ackerman said. Other factors include debt service, new software needs, professional consultant fees, and salaries and benefits. The ISO plans to add 15 new positions over the coming year. The board will review the draft budget Oct. 15, the MC will vote on a new budget Oct. 31, and the board will consider the final proposal on Nov. 13, 2018. The committee approved the ISO’s 2018 Reliability Needs Assessment (RNA), which identified no reliability needs on the state’s bulk power system over the coming decade. The board will consider the RNA in October. Resource Planning Manager Laura Popa reported that the 2018 RNA is based on information from the 2018 Gold Book (the annual transmission planning and evaluation report filed with FERC), historical data and market participant data. For transmission security, planners evaluated Year 1 (2019), Year 5 (2023) and Year 10 (2028) for summer peak baseline power flow cases, and found no reliability needs for Years 1 and 5. However, for Year 10 they identified one preliminary reliability need: a 3-MW deficiency in Eastern Long Island. The deficiency would stem from a 1% overload on the 138-kV Brookhaven-Edwards Avenue line (Line 864), the contingency being the loss of the 138-kV Wildwood-Riverhead line (Line 890) and returning the system to normal criteria. PSEG Long Island presented an updated and firm long-range transmission plan at the June 28 Electric System Planning Working Group/Transmission Planning Advisory Subcommittee that involved scheduling terminal upgrades at the Brookhaven 138-kV substation to be in service in June 2019. With these upgrades the overload is resolved, according to NYISO. LeeVanSchaick elaborated on MMU comments filed with the ISO that markets are generally well designed, noting an inconsistency between the assumed value of certain resources needed for reliability transmission planning purposes and how NYISO’s capacity market compensates those resources. The MMU recommends the ISO periodically reassess the assumed relief from land-based wind generators and special case resources (SCRs) in transmission security planning assessments to ensure levels are commensurate with their expected performance and availability. It also asked the ISO consider using different assumptions for offshore wind generators than for land-based wind units, and possibly further discount the capacity ascribed to wind generators and SCRs, which represent load capable of being interrupted upon demand or a distributed generator rated 100 kW or higher. Failure to maintain consistency between planning reliability criteria and capacity market requirements may increase the need for regulated transmission solutions and reliability-must-run contracts to satisfy reliability needs, which becomes particularly important as more wind generation is built in import-constrained areas over the coming decade, the MMU said. “It’s important to think about this as the resource mix is turning over,” LeeVanSchaick said. Customers and market participants continue to be pleased with how NYISO interacts with them and are nearly 100% satisfied with how the ISO answers their questions, according to a biannual customer satisfaction survey conducted by the Siena College Research Institute (SRI). SRI Director Don Levy told the MC his group recorded a 98% “customer inquiry satisfaction” score on the survey, which combined a market participant satisfaction score (89.9%) with assessment of performance (76.8%) for an overall approval rating of 84.7%. Levy said the surveys identified several areas for improvement, including tariff, legal and regulatory webpages; ISO manuals, technical bulletins and user’s guides; market mitigation and analysis interactions; transparency of operations; and increasing the consideration of stakeholder input. The MC approved revisions to Attachment L of NYISO’s Open Access Transmission Tariff updating terms regarding transmission congestion contracts (TCCs). Gregory R. Williams, manager of TCC market operations, said the updates to Section 18.1.1 (Table 1A) of Attachment L followed an annual review. Among the changes were revising contract expiration dates from Dec. 31, 2017, to Dec. 31, 2027, for two specified agreements. If authorized by the board at its meeting in October, the ISO will file the revisions with FERC. The MC approved changes to the ISO’s unsecured credit scoring model following its first review of the methodology since 2009. Rating all market participants — including corporations, financial institutions and government entities — on the same scorecard may mask differences between them, the analysis found. If authorized by the board in October, the ISO will file the revisions to Attachment K of the Market Administration and Control Area Services Tariff with FERC.